Look to the trusted technicians at Stafford Home Service to keep your home’s heating, cooling, and air quality systems running smoothly and efficiently. We offer a wide range of services, products, and systems and, with our extensive knowledge and experience, will make recommendations that best fit your home, your lifestyle, and your budget. We are pleased to offer Safety & Efficiency Agreements for your heating and cooling systems, offering precision tune-ups for your furnace and air conditioning systems that will extend equipment life, increase efficiency and lower utility bills, and give your family peace of mind. Learn more about our Safety & Efficiency Agreements or call us today. The technicians at Stafford Home Service are licensed, bonded, and insured. We hold EPA Lead Certification, and Gastight installer certification. We are an Xcel registered contractor. Stafford Home Service provides both heating and cooling services for homeowners in Minneapolis, St. Paul, and the surrounding metro area. From repair and maintenance to replacement and installation, Stafford Home Service works hard to ensure your complete satisfaction. Learn more about the heating and cooling services we offer. Contact Stafford Home Service to schedule an appointment today. Improve the air quality of your home with an air cleaner or air purifier from Stafford Home Service. According to the US Department of Energy, a central air conditioning system may last anywhere from 10 to 20 years. Stafford Home Service offers services for unexpected and emergency cooling system repairs. Stafford Home Service offers various air exchanger options, including Heat Recovery Ventilators and Energy Recovery Ventilators. A clogged air filter doesn’t just affect the air quality of your home but is also the number one cause of HVAC system failure. Stafford Home Service offers hydronic system design and installation, boiler replacement, and boiler retrofits. Stafford Home Service can install a conventional air conditioning system that best fits your home, your lifestyle, and your budget. To improve the overall quality of the air in your home – and your family’s health– we recommend regularly scheduled duct cleaning. Using a ductless heat pump can be a practical, efficient option for heating, cooling, and dehumidification. Our quality design and workmanship ensures both proper airflow and effective heating and cooling. Thermostats are installed in each room or zone, and dampers are installed into ductwork to control air flow. Stafford Home Service is proud to install heating systems from Daikin, a trusted name in heating and cooling. A malfunctioning heating system is both an inconvenience and a safety issue, especially during frigid Minnesota winters. 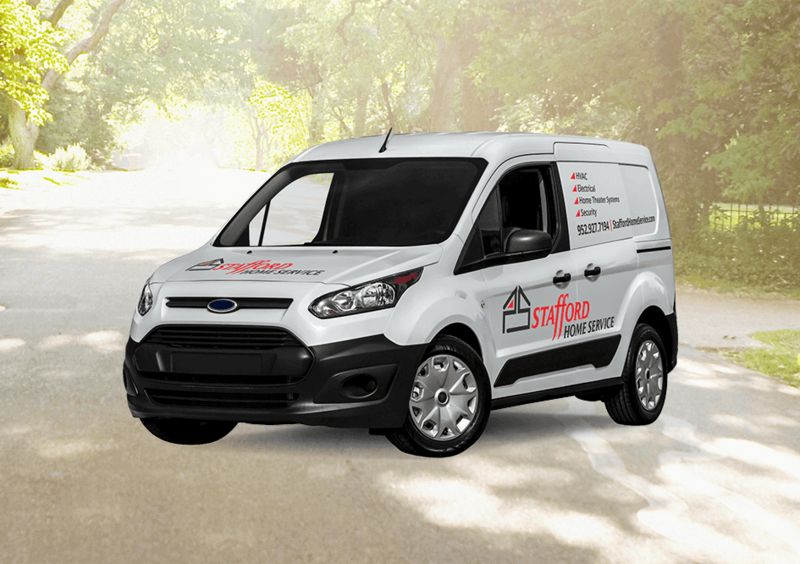 Contact Stafford Home Service for a furnace inspection to ensure the safety and security of your home and your family. Stafford Home Service installs high velocity air conditioning manufactured by Spacepak and Unico. Dry air can negatively impact your health and the condition of your home. Heating or cooling system malfunctions can cause inconvenience, safety issues, and damage to the equipment if not addressed. Indoor air quality monitors and other equipment are convenient, easy to use, and offer homeowners peace of mind. Odors in the home can be long-lasting and penetrate carpets, furniture, and more. Trust the experts at Stafford Home Service to keep your home running smoothly. Before the start of each heating and cooling season, we recommend that our experienced technicians inspect your HVAC system. A thermostat controls the indoor temperature of your home and can also regulate humidity and air quality. Many home owners are choosing to install UV lights to remove odors and VOCs, or volatile organic compounds. Too much moisture in the air inside your home can cause a number of problems.